Elegant plastic stemware that just won't crack (we tested it), stunning glasses from Europe and gorgeous new tasting rooms in Napa Valley. We dropped, bashed and stepped on these new BPA-free plastic glasses from Sur La Table (left), but they would not crack. The delicately lipped, crystal-clear glasses come in several styles, from highballs to flutes, and are perfect for outdoor entertaining. $40 for a set of six; surlatable.com. Holmegaard's "Cocoon" glasses have undulating stems (right). $37 for two; scantrendsusa.com. 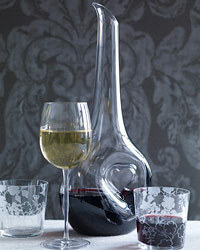 Riedel's new trio of "Black Tie" decanters includes this one (right), sweetly called "Bliss." $195; riedelwebstore.com. "Emperor's Garden" crystal is from Sieger by Theresienthal (right). From $190; marymahoney.com. Merus. Photo © Dim Balsem. Erika Gottl, co-founder of Napa Cabernet producer Merus and a talented designer, created three modern new tasting and event spaces at the winery. By appointment only; meruswines.com. Domaine Chandon's tasting room displays artist V.E. Long's colorful mosaic vases and portraits through June.